We’d love your help. Let us know what’s wrong with this preview of The Lost Heir by Tui T. Sutherland. She can't believe it's finally happening. Tsunami and her fellow dragonets of destiny are journeying under the water to the great SeaWing Kingdom. 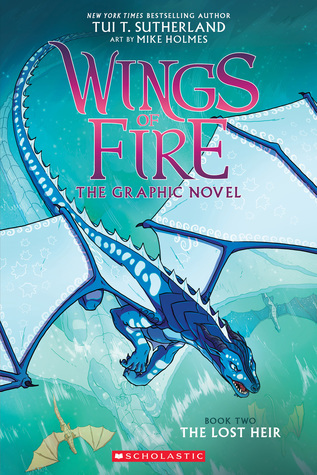 Stolen as an egg from the royal hatchery, Tsunami is eager to me The New York Times bestselling Wings of Fire series soars to new heights in this graphic novel adaptation! Darkclaws the Nightwing-Seawing Hybrid This is a fiction book, and therefore unfit for being used as a resource. I SOOOOOOOOOOOOO want to read this book! ? This is the second book in the Wings of Fire graphic novel series. I don’t have a ton to say about this book. It is a well done graphic novel version of the 2nd full length book in the Wings of Fire series. The illustration is solid and the story is similar to the book. My son is a huge Wings of Fire fan, so he has been getting these to read and giving them to me to read when he is done. Tsunami journeys to the SeaWings to find her mother, Queen Coral, and learn about her family. However things d This is the second book in the Wings of Fire graphic novel series. I don’t have a ton to say about this book. It is a well done graphic novel version of the 2nd full length book in the Wings of Fire series. The illustration is solid and the story is similar to the book. My son is a huge Wings of Fire fan, so he has been getting these to read and giving them to me to read when he is done. Tsunami journeys to the SeaWings to find her mother, Queen Coral, and learn about her family. However things don’t turn out as she expects. The illustration is colorful, well done, and easy to follow. The dialogue is just as witty and cute as it was in the full length book. I do like the full length book better than these graphic novel versions, however these are a good option for kids who find the full length novels intimidating. This is one of the better book to graphic novel series out there. I think both kids and adults who are fans of the Wings of Fire series will enjoy. Just be aware this doesn’t add anything to the world or story, just repeats it. Overall this is a very well done graphic novel rendition of the second book in the Wings of Fire series. While I wouldn’t seek these out on my own, I will continue to read them as long as my son does. Recommended to fans of the Wings of Fire series, or those who would rather read this series in graphic novel than full length novel format. Compared to The Dragonet Prophecy, The Lost Heir is better in consistency, but there is still the issue of the artwork and the general pacing. Main problems with this: the facial expressions sometimes are beyond bizarre and make no sense. I definitely think the artist does best with over-the-top dramatic expressions, but even then they can look truly odd. Some of the weirder ones would be Glory talking to the gang in the beginning, and Tsunami's monologues. Another problem were Tsunami's 3.5 stars. Another problem were Tsunami's monologues. A lot of the story takes place under the water, keeping the reader inside Tsunami's head and the only language spoken was Aquatic. It took several seconds for me to even notice that the scales on the dragons were glowing at all because it was so faint. That could have definitely been drawn better with more emphasis on the shining scales or drawing more glow areas. There were a lot of pages where Tsunami's head or body moved down the page diagonally to show her speaking or thinking, but, again, this was oddly done. I do think that could have been done differently without so much repetition to the pages whenever she did that. There were moments where the artwork would suddenly get immensely better and more detailed for no reason at all, but then revert back to the more cartoonish styles. The juxtaposition of this showed just how oddly drawn some of the dragons are when in the more cartoon style. The heads and bodies do not fully look proportionate or normal to how they would move. There is one scene, near the end, where Coral and another character are on thrones, and what makes no sense is that the dragons are sitting in the thrones as though they were humans (back straight, legs down, arms on the rests). Anatomically speaking, having dragons crouch on their legs like that would be immensely painful as well as make no sense as they are four legged creatures. Why would they ever sit on their hind end like a human? I love it, even more, when I read the graphic novel. I love it even moreeee now that I have started reading this series again after I first fell in love with it in 6th grade. Usually, when I encounter books that I haven't read in a while, I don't love them as I did years ago. This, THIS, was a huge exception! My love for this series has quadrupled since I read it in 6th grade. As usual, I love all the dragonets but my love for Tsunami has gone down and my love for Glory has gone up. I just love Glory's attitude and her sarcastic comments which sort of relates to me and I don't like Tsunami's attitude in this book. Don't get me wrong, I love her, it's just that her attitude threw me off. She was sort of acting high and mighty....? It's been a long time since I read the full-length second Wings of Fire book, so I'd pretty much forgotten the whole plot. But this graphic novel did a great job summing it up for me! This story looks great in full-color illustrations, and I do remember this book being one of my favorites of the series (the real novel, that is). My only complaint- and this is a dumb one, too- is that it sort of takes away what I'd imagined the setting to look like. Not how I pictured the SeaWing palace, but I gu It's been a long time since I read the full-length second Wings of Fire book, so I'd pretty much forgotten the whole plot. But this graphic novel did a great job summing it up for me! This story looks great in full-color illustrations, and I do remember this book being one of my favorites of the series (the real novel, that is). My only complaint- and this is a dumb one, too- is that it sort of takes away what I'd imagined the setting to look like. Not how I pictured the SeaWing palace, but I guess that's how it's supposed to look. The original book was an amazing story with developed characters and twists and turns. Seeing it illustrated was like seeing it for the first time and I loved it! The panels and speech bubbles were clear and the colors were vibrant. I was hoping to see some innovative character designs but like the last graphic novel it wasn't so. I do have to say the character designs of the seawings were much better than the skywings of the last novel. Still a wonderful read all around. My son found this one harder to follow because he hasn't read the books yet. But I still think it's well drawn and, for the most part, the story flows well without having read the books. As an adult reader, I was able to fill in the blanks more than my son was which is probably why he struggled to get through it a bit more than the other volume. He still wants book #3 though so that's a good sign. I feel like this book wasn't as adapted well as the first one. It left out scenes that I feel like were important. The prologue was a different scene entirely and so later when we're supposed to feel this strong sense of betrayal, there is nothing, because it was changed. Otherwise, I thought this was adapted alright. Reading this book with all the illustrations was so much fun! Especially because of how hard it was for me to imagine the Summer Palace. I really like this art style and the way you can tell which dragons are which even when they're all SeaWings or whatever. I wouldn't suggest reading this over the original novel, but I would definitely suggest reading them both, in whichever order you prefer. I recommend this book because it has a great story line if you like to get into books then this is your book. This has amazingly vibrant colors. The adventure is interesting enough to not feel 100% childish. I will see out the next book in the series. Each character is well thought through and has its own unique voice. 4.5 stars. Better than the first graphic novel - I felt like I could better distinguish the dragons from the same tribe without having to pour over the pages. And the story didn't feel chunky or like there were gaps when they streamlined it for this format. This was terrific! I loved it! It was the 2nd book that came to life! I love Tsunami! I liked where the author took this trade. The intrigue and back story were fun. I like how the author drew the Summer Palace and the Deep Palace because they really match the descriptions in the main book. I also like how Anemone and Auklet look. A beautiful representation of Book 2. It's nice to see all the different SeaWings as they are described in the original novel. Tsunami really makes me angry sometimes the way she is so stubborn. This was just okay. Felt a bit crammed. There’s probably more to the novel... maybe. The book is lacking in story telling against the novel but still well illustrated. I have to say the art is really gorgeous! wings of fire is the best series I’ve seen it is good for people any age and it’s a action packed book that you will want to never stop reading!!! Fun book to read aloud to the kids. Interesting plot, and good illustrations. Very good but dark and violent! Better than the first! Highly recommend. Plus the art style is continually beautiful! Such a nice way to get reluctant readers interested in the novels. I was born July 31 (same birthday as Harry Potter!) in Caracas, Venezuela, and lived in Asuncion, Paraguay Okay, I know what you’re thinking. Tui? What kind of name is that? Is it short for something?